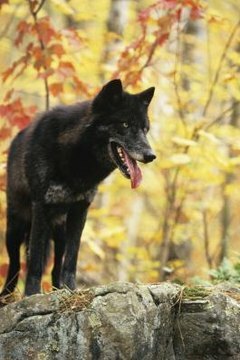 The first wolf came into existence between 4.5 and 9 million years ago, having evolved from tomartcus, a now extinct mammal who existed 30 million to 40 million years ago. Humans had little contact with wolves in the beginning. It wasn’t until relatively recently that humans began to have an impact on wolves, but once our paths crossed, that impact was monumental and changed the course of evolution for both species. Approximately 15,000 years ago, wolves encountered human settlements for the first time. This was an evolutionary turning point for the wolf. These wolves approached the human settlements with caution, but slowly learned that by their proximity to humans, they could scavenge on the waste, reducing the need for hunting. Humans were naturally aversive to the presence of wolves, but learned over time that the weaker, meeker wolves posed a relatively low threat. This set the scene for one of the most important evolutionary milestones in human and lupine history. The interaction between wolves and humans led humans to identify certain advantages in living alongside and with the wolf. Namely, wolves could protect human settlements, assist with hunting and in return, we could provide them with a steadier food supplier and relieve them of some of the duties associated with raising their young. It was from this initial interaction that man domesticated the wolf, which led to the eventual creation of the domesticated dog we know and love today. As man domesticated the wolf, he changed the course of the wolf’s physical evolution. Nature favors strong, healthy specimens with powerful jaws for hunting. Man favored weaker, tamer specimens more suitable for co-habitation with humans. For this reason, man bred weaker, smaller wolves to create weaker, smaller offspring. These smaller, weaker wolves do not exist today, because they evolved to become dogs. But man did not domesticate all wolves, and wild populations continued to evolve independently of man. Although man tamed and domesticated some wolves, conflict between human and lupine populations has existed ever since human and lupine paths crossed. Wolves are naturally cautious of humans and humans have a cultural and historical fear of wolves. Human developments, such as the building of roads, has caused population redistribution in wolves, leading to isolation of wolf populations. Over time, population isolation can lead to divergence, as wolves evolve and adapt to new habitats and become distinct from their ancestors. Man’s conflict with wolves has led to population decline. Wolves are top level predators and even today, humans are fearful of contact with such animals. Modern humans routinely kill wolves, due to the threat they pose to human populations and their livestock. For this reason, wolf populations close to human populations can decline. Macalester College: What Makes a Wolf a Wolf? How Have Dogs Evolved Over the Years?